Although syntectonic sedimentation has been shown to be one of the most important factors involved in thrust belt deformation, previous studies have mostly focused on the influence of just one stage in this context. Two geometric sediment packages that are described as progradation and aggradation are known to lead to different thrust belt deformation subsequences, yet the influence of multistage sedimentary strata remains less well-understood. Interpretation of the latest seismic data shows that the Western Kunlun thrust belt is characterized by classical triangle zone. There are two adjacent sections with different geometrical characteristics, a prograding monocline and a spaced-ramp anticline. We restored these two sections and analyzed the potential geological factors leading to their formation in this study. The results of this analysis provide new insights into a kinematic model for triangle zones and suggest that these two distinct styles formed because of two-stage syntectonic sedimentation. We further discuss the kinematic model of tectonic deformation given the presence of two-stage syntectonic sediments and propose four distinct sedimentary superposition patterns. All of these sequences suggest that deformation is controlled by total syntectonic sediment geometry and imply that early sediment shape exerts the greatest influence. The presence of early prograding sediment promotes the development of the spaced thrust belt, while an early aggrading package enhances the structure of the restricted thrust adjacent to the hinterland. This work is funded by the National Science and Technology Major Project No. 41572202. 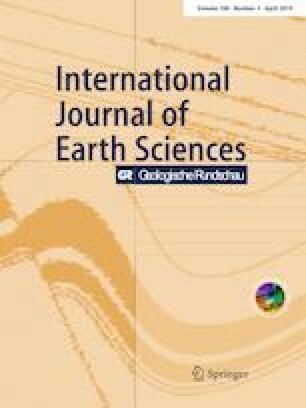 We would like to thank the Korla Branch Research Institution of BGP Inc. for allowing the publication of the seismic lines shown in this paper. We also thank Rick Groshong, Wenjiao Xiao and another anonymous reviewer for their valuable comments and insightful suggestions, which have significantly improved the scientific impact of this paper. Journal Editor-in-Chief Prof. Wolf-Christian Dullo is warmly thanked for his support.